March madness! 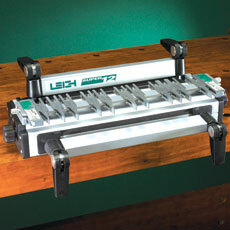 Free $109 router bit set with the purchase of a Leigh Super 18 or Super 24 dovetail jig. Here’s How It Works! During the month of March 2010, buy a Leigh Super Jig Dovetail Jig, 18″ or 24″ only, from your favorite woodworking tool store, and we will send the 7-piece bit set for the Super Jig, absolutely free! That’s a $109.00 value! For complete instructions from Leigh, make sure to check their web page. You must fill out a form and send the original dated cash register receipt. All receipts must be dated between March 1 and March 31, 2010, and all claims must be made before April 30, 2010. And, as always, if you buy from one of my Affiliates (below), you will help my effort, as I get a small percentage of your purchases. Disclosure: Leigh is a sponsor of my blog.